Everyone has passion points that they are obsessed with, and it's impossible to be aware and stay on top of every trend that is exploding into the zeitgeist, but that doesn't seem to be stopping women from trying to keep up with the latest trends across a host of different categories. As part of the POPSUGAR Insights Content, Commerce, and Culture study, we surveyed over 1,500 women between the ages of 18-44 and asked them to tell us how important it is to them to be aware of emerging or popular trends in lifestyle categories. For beauty, nearly 97% of women felt that it's important to be aware of emerging or popular category trends, with 42% of women saying that it's "extremely important" and 75% viewing it as "extremely important" or "important". For fashion, 97% of women felt that it's important to be aware of emerging or popular category trends, with 41% of women saying that it's "extremely important" and 77% viewing it as "extremely important" or "important". For fitness, 97% of women felt that it's important to be aware of emerging or popular category trends, with 40% of women saying that it's "extremely important" and 71% viewing it as "extremely important" or "important". In food and cooking, 98% of women felt that it's important to be aware of emerging or popular category trends, with 40% of women saying that it's "extremely important" and 76% viewing it as "extremely important" or "important". 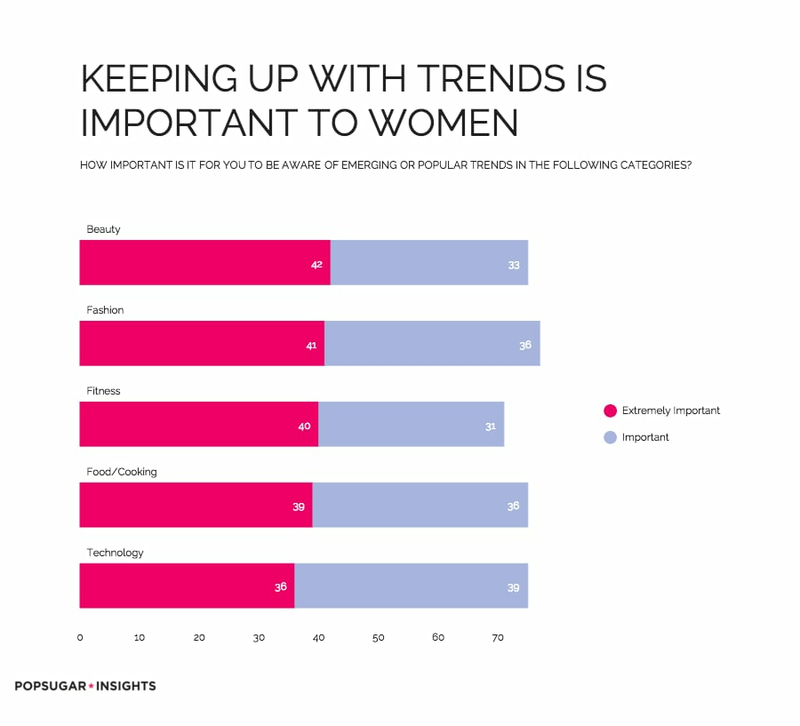 For technology, 99% of women felt that it's important to be aware of emerging or popular category trends, with 36% of women saying that it's "extremely important" and 75% viewing it as "extremely important" or "important".